Not to be confused with Axis powers. Tsar Ferdinand I of Bulgaria. 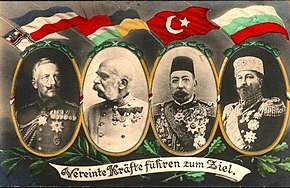 The Central Powers (German: Mittelmächte; Hungarian: Központi hatalmak; Turkish: İttifak Devletleri / Bağlaşma Devletleri; Bulgarian: Централни сили, translit. Tsentralni sili), consisting of Germany, Austria-Hungary, the Ottoman Empire and Bulgaria—hence also known as the Quadruple Alliance (German: Vierbund)—was one of the two main coalitions that fought World War I (1914–18). It faced and was defeated by the Allied Powers that had formed around the Triple Entente. The Powers' origin was the alliance of Germany and Austria-Hungary in 1879. 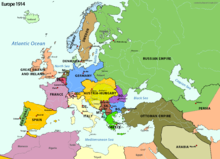 Despite having nominally joined the Triple Alliance before, Italy did not take part in World War I on the side of the Central Powers; the Ottoman Empire and Bulgaria did not join until after World War I had begun, even though the Ottoman Empire had retained close relations with both Germany and Austria-Hungary since the beginning of the 20th century. 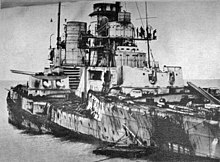 German battlecruiser SMS Seydlitz heavily damaged after the Battle of Jutland. In early July 1914, in the aftermath of the assassination of Austro-Hungarian Archduke Franz Ferdinand and the immediate likelihood of war between Austria-Hungary and Serbia, Kaiser Wilhelm II and the German government informed the Austro-Hungarian government that Germany would uphold its alliance with Austria-Hungary and defend it from possible Russian intervention if a war between Austria-Hungary and Serbia took place. When Russia enacted a general mobilization, Germany viewed the act as provocative. The Russian government promised Germany that its general mobilization did not mean preparation for war with Germany but was a reaction to the events between Austria-Hungary and Serbia. The German government regarded the Russian promise of no war with Germany to be nonsense in light of its general mobilization, and Germany, in turn, mobilized for war. On 1 August, Germany sent an ultimatum to Russia stating that since both Germany and Russia were in a state of military mobilization, an effective state of war existed between the two countries. Later that day, France, an ally of Russia, declared a state of general mobilization. In August 1914, Germany waged war on Russia, the German government justified military action against Russia as necessary because of Russian aggression as demonstrated by the mobilization of the Russian army that had resulted in Germany mobilizing in response. After Germany declared war on Russia, France with its alliance with Russia prepared a general mobilization in expectation of war. On 3 August 1914, Germany responded to this action by declaring war on France. Germany, facing a two-front war, enacted what was known as the Schlieffen Plan, that involved German armed forces needing to move through Belgium and swing south into France and towards the French capital of Paris. This plan was hoped to quickly gain victory against the French and allow German forces to concentrate on the Eastern Front. Belgium was a neutral country and would not accept German forces crossing its territory. Germany disregarded Belgian neutrality and invaded the country to launch an offensive towards Paris. This caused Great Britain to declare war against the German Empire, as the action violated the Treaty of London that both nations signed in 1839 guaranteeing Belgian neutrality and defense of the kingdom if a nation reneged. Subsequently, several states declared war on Germany in late August 1914, with Italy declaring war on Austria-Hungary in 1915 and Germany on 27 August 1916, the United States declaring war on Germany on 6 April 1917 and Greece declaring war on Germany in July 1917. Upon its founding in 1871, the German Empire controlled Alsace-Lorraine as an "imperial territory" incorporated from France after the Franco-Prussian War. It was held as part of Germany's sovereign territory. Germany held multiple African colonies at the time of World War I. All of Germany's African colonies were invaded and occupied by Allied forces during the war. Cameroon, German East Africa, and German Southwest Africa were German colonies in Africa. Togoland was a German protectorate in Africa. The Kiautschou Bay concession was a German dependency in East Asia leased from China in 1898. It was occupied by Japanese forces following the Siege of Tsingtao. German New Guinea was a German protectorate in the Pacific. It was occupied by Australian forces in 1914. German Samoa was a German protectorate following the Tripartite Convention. It was occupied by the New Zealand Expeditionary Force in 1914. Austro-Hungarian soldiers marching up Mount Zion in Jerusalem in the Ottoman Empire, during the Middle Eastern campaign. Austria-Hungary regarded the assassination of Archduke Franz Ferdinand as being orchestrated with the assistance of Serbia. The country viewed the assassination as setting a dangerous precedent of encouraging the country's South Slav population to rebel and threaten to tear apart the multinational country. Austria-Hungary formally sent an ultimatum to Serbia demanding a full-scale investigation of Serbian government complicity in the assassination, and complete compliance by Serbia in agreeing to the terms demanded by Austria-Hungary. Serbia submitted to accept most of the demands, however Austria-Hungary viewed this as insufficient and used this lack of full compliance to justify military intervention. These demands have been viewed as a diplomatic cover for what was going to be an inevitable Austro-Hungarian declaration of war on Serbia. Austria-Hungary had been warned by Russia that the Russian government would not tolerate Austria-Hungary crushing Serbia. However, with Germany supporting Austria-Hungary's actions, the Austro-Hungarian government hoped that Russia would not intervene and that the conflict with Serbia would be a regional conflict. Austria-Hungary's invasion of Serbia resulted in Russia declaring war on the country and Germany in turn declared war on Russia, setting off the beginning of the clash of alliances that resulted in the World War. Austria-Hungary was internally divided into two states with their own governments, joined in communion through the Habsburg throne. Austrian Cisleithania contained various duchies and principalities but also the Kingdom of Bohemia, the Kingdom of Dalmatia, the Kingdom of Galicia and Lodomeria. Hungarian Transleithania comprised the Kingdom of Hungary and the Kingdom of Croatia-Slavonia. In Bosnia and Herzegovina sovereign authority was shared by both Austria and Hungary. Ottoman soldiers in military preparations for an assault on the Suez Canal in 1914. Kaiser Wilhelm II visiting the Turkish cruiser Yavuz Sultan Selim during his stay in Istanbul in October 1917 as a guest of Sultan Mehmed V.
The Ottoman Empire joined the war on the side of the Central Powers in November 1914. The Ottoman Empire had gained strong economic connections with Germany through the Berlin-to-Baghdad railway project that was still incomplete at the time. The Ottoman Empire made a formal alliance with Germany signed on 2 August 1914. The alliance treaty expected that the Ottoman Empire would become involved in the conflict in a short amount of time. However, for the first several months of the war the Ottoman Empire maintained neutrality though it allowed a German naval squadron to enter and stay near the strait of Bosphorus. Ottoman officials informed the German government that the country needed time to prepare for conflict. 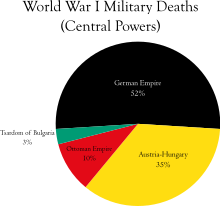 Germany provided financial aid and weapons shipments to the Ottoman Empire. After pressure escalated from the German government demanding that the Ottoman Empire fulfill its treaty obligations, or else Germany would expel the country from the alliance and terminate economic and military assistance, the Ottoman government entered the war with the recently acquired cruisers from Germany, the Yavuz Sultan Selim (formerly SMS Goeben) and the Midilli (formerly SMS Breslau) launching a naval raid on the Russian port of Odessa, thus engaging in a military action in accordance with its alliance obligations with Germany. Russia and the Triple Entente declared war on the Ottoman Empire. Bulgarian soldiers firing at an incoming aircraft. Bulgaria was still resentful after its defeat in July 1913 at the hands of Serbia, Greece and Romania. It signed a treaty of defensive alliance with the Ottoman Empire on 19 August 1914. It was the last country to join the Central Powers, which Bulgaria did in October 1915 by declaring war on Serbia. It invaded Serbia in conjunction with German and Austro-Hungarian forces. Bulgaria held claims on the region of Vardar Macedonia then held by Serbia following the Balkan Wars of 1912–1913 and (from the Bulgarian point of view), the costly Treaty of Bucharest (1913). As a condition of entering WW1 on the side of the Central Powers, Bulgaria was granted the right to reclaim that territory. In opposition to the Union of South Africa, which had joined the war, Boer rebels refounded the South African Republic in 1914 and engaged in the Maritz Rebellion. Germany assisted the rebels, and the rebels operated in and out of the German colony of German South-West Africa. The rebels were eventually defeated by British imperial forces. The Dervish movement was a rebel Somali movement led by Mohammed Abdullah Hassan seeking independence of Somali territories. Dervish forces fought against Italian and British forces in Italian Somaliland and British Somaliland in the Somaliland Campaign. The Dervish movement received support from Germany and the Ottoman Empire, and also briefly from the Ethiopian Empire from 1915–1916. The Senussi Order was a Muslim political-religious tariqa (Sufi order) and clan in Libya, previously under Ottoman control, which had been lost to Italy in 1912. In 1915, they were courted by the Ottoman Empire and Germany and Grand Senussi Ahmed Sharif as-Senussi declared jihad and attacked the Italians in Libya and British controlled Egypt in the so called Senussi Campaign. The Sultanate of Darfur forces aligned themselves with the Central Powers and fought against British forces in Anglo-Egyptian Sudan in the Anglo-Egyptian Darfur Expedition of 1916. During 1917 and 1918, the Finns under Carl Gustaf Emil Mannerheim and Lithuanian nationalists fought Russia for a common cause. With the Bolshevik attack of late 1917, the General Secretariat of Ukraine sought military protection first from the Central Powers and later from the armed forces of the Entente. The Ottoman Empire also had its own allies in Azerbaijan and the Northern Caucasus. The three nations fought alongside each other under the Army of Islam in the Battle of Baku. The Belarusian People's Republic was a client state of Germany created in 1918. The Duchy of Courland and Semigallia was a client state of Germany created in 1918. The Crimean Regional Government was a client state of Germany created in 1918. The Don Republic was closely associated with the German Empire and fought against the Bolsheviks. The Kingdom of Finland was a client state of Germany created in 1918. Prior to the declaration of the kingdom, Finland existed as an autonomous Grand Duchy of Russia since 1809. The Kuban People's Republic was a client state of Germany created in 1918. The Kingdom of Lithuania was a client state of Germany created in 1918. The Mountainous Republic of the Northern Caucasus was associated with the Central Powers. The Democratic Republic of Georgia declared independence in 1918 which then to led border conflicts between newly formed republic and Ottoman Empire. Soon after Ottoman Empire invaded the republic and quickly reached Borjomi. This forced Georgia to ask for help from Germany which they were granted. Germany forced the Ottomans to withdraw from Georgian territories and recognize Georgian sovereignty. Germany, Georgia and the Ottomans signed a peace treaty, the Treaty of Batum which ended the conflict with the last two. in return Georgia become a German "ally". This time period of Georgian-German friendship was known as German Caucasus expedition. The Kingdom of Poland was a client state of Germany created in 1916. This government was recognized by the emperors of Germany and Austria-Hungary in November 1916, and it adopted a constitution in 1917. The decision to create a Polish State was taken by Germany in order to attempt to legitimize its military occupation amongst the Polish inhabitants, following upon German propaganda sent to Polish inhabitants in 1915 that German soldiers were arriving as liberators to free Poland from subjugation by Russia. The state was utilized by the German government alongside punitive threats to induce Polish landowners living in the German-occupied Baltic territories to move to the state and sell their Baltic property to Germans in exchange for moving to Poland, and efforts were made to induce similar emigration of Poles from Prussia to the state. The Ukrainian State was a client state of Germany led by Hetman Pavlo Skoropadskyi, who overthrew the government of the Ukrainian People's Republic. The United Baltic Duchy was a proposed client state of Germany created in 1918. In 1918, the Azerbaijan Democratic Republic, facing Bolshevik revolution and opposition from the Muslim Musavat Party, was then occupied by the Ottoman Empire, which expelled the Bolsheviks while supporting the Musavat Party. The Ottoman Empire maintained a presence in Azerbaijan until the end of the war in November 1918. Jabal Shammar was an Arab state in the Middle East that was closely associated with the Ottoman Empire. States listed in this section were not officially members of the Central Powers, but at some point during the war engaged in cooperation with one or more Central Powers members on a level that makes their neutrality disputable. The Ethiopian Empire was officially neutral throughout World War I but widely suspected of sympathy for the Central Powers between 1915 and 1916. At the time, Ethiopia was one of the few independent states in Africa and a major power in the Horn of Africa. Its ruler, Lij Iyasu, was widely suspected of harbouring pro-Islamic sentiments and being sympathetic to the Ottoman Empire. The German Empire also attempted to reach out to Iyasu, dispatching several unsuccessful expeditions to the region to attempt to encourage it to collaborate in an Arab Revolt-style uprising in East Africa. One of the unsuccessful expeditions was led by Leo Frobenius, a celebrated ethnographer and personal friend of Kaiser Wilhelm II. Under Iyasu's directions, Ethiopia probably supplied weapons to the Muslim Dervish rebels during the Somaliland Campaign of 1915 to 1916, indirectly helping the Central Powers' cause. 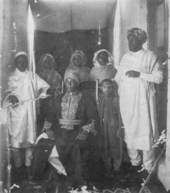 Fearing the rising influence of Iyasu and the Ottoman Empire, the Christian nobles of Ethiopia conspired against Iyasu over 1915. Iyasu was first excommunicated by the Ethiopian Orthodox Patriarch and eventually deposed in a coup d'état on 27 September 1916. A less pro-Ottoman regent was installed on the throne. Other movements supported the efforts of the Central Powers for their own reasons, such as the radical Irish Nationalists who launched the Easter Rising in Dublin in April 1916; they referred to their "gallant allies in Europe". However, the majority of Irish Nationalists supported the British and allied war effort up until 1916 when the Irish political landscape was changing. In 1914, Józef Piłsudski was permitted by Germany and Austria-Hungary to form independent Polish legions. Piłsudski wanted his legions to help the Central Powers defeat Russia and then side with France and the UK and win the war with them. Bulgaria signed an armistice with the Allies on 29 September 1918, following a successful Allied advance in Macedonia. The Ottoman Empire followed suit on 30 October 1918 in the face of British and Arab gains in Palestine and Syria. 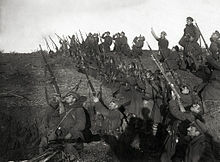 Austria and Hungary concluded ceasefires separately during the first week of November following the disintegration of the Habsburg Empire and the Italian offensive at Vittorio Veneto; Germany signed the armistice ending the war on the morning of 11 November 1918 after the Hundred Days Offensive, and a succession of advances by New Zealand, Australian, Canadian, Belgian, British, French and US forces in north-eastern France and Belgium. There was no unified treaty ending the war; the Central Powers were dealt with in separate treaties. 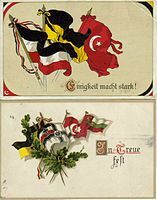 A postcard depicting the flags of the Central Powers' countries. The collapse of the Central Powers in 1918. The Leaders of Central Powers in 1914. ^ All figures presented are for the year 1913. ^ Hindenburg, Paul von (1920). Out of my life. Internet Archive. London : Cassell. p. 113. ^ Meyer, G.J. (2007). A World Undone: The Story of the Great War, 1914 to 1918. Delta Trade Paperback. ISBN 978-0-553-38240-2. ^ S.N. Broadberry, Mark Harrison. The Economics of World War I. illustrated ed. Cambridge University Press, 2005, pp. 9-10. ^ Spencer Tucker (1996). The European Powers in the First World War. p. 173. ISBN 9780815303992. ^ a b c d Meyer, G.J. A World Undone: The Story of the Great War, 1914 to 1918. Delta Book. 2006. P39. ^ a b Meyer, G.J. A World Undone: The Story of the Great War, 1914 to 1918. Delta Book. 2006. P95. ^ Hagen, William W. German History in Modern Times: Four Lives of the Nation. P228. ^ Tucker, Spencer C. A Global Chronology of Conflict: From the Ancient World to the Modern Middle East: From the Ancient World to the Modern Middle East. ABC-CLIO. 2009. P1556. ^ Hickey, Michael. The First World War: Volume 4 The Mediterranean Front 1914–1923. P31. ^ a b c Afflerbach, Holger; David Stevenson, David. An Improbable War: The Outbreak of World War 1 and European Political Culture. Berghan Books. 2012. P. 292. ^ Afflerbach, Holger; David Stevenson, David. An Improbable War: The Outbreak of World War I and European Political Culture. Berghan Books. 2012. P. 293. ^ Hall, Richard C. "Bulgaria in the First World War". Russia's Great War and Revolution. Retrieved 22 September 2017. ^ Jelavich, Charles; Jelavich, Barbara (1986). The establishment of the Balkan national states, 1804–1920 (1st pbk. ed.). Seattle: University of Washington Press. pp. 284–297. ISBN 978-0-295-96413-3. ^ Richard C. Hall, "Bulgaria in the First World War." Historian 73.2 (2011): 300-315. ^ Mukhtar, Mohammed (25 February 2003). Historical Dictionary of Somalia. Scarecrow Press. p. 126. ISBN 9780810866041. Retrieved 28 February 2017. ^ The Regency Kingdom has been referred to as a puppet state by Norman Davies in Europe: A history (Google Print, p. 910); by Jerzy Lukowski and Hubert Zawadzki in A Concise History of Poland (Google Print, p. 218); by Piotr J. Wroblel in Chronology of Polish History and Nation and History (Google Print, p. 454); and by Raymond Leslie Buell in Poland: Key to Europe (Google Print, p. 68: "The Polish Kingdom... was merely a pawn [of Germany]"). ^ J. M. Roberts. Europe 1880–1945. P. 232. ^ Aviel Roshwald. Ethnic Nationalism and the Fall of Empires: Central Europe, the Middle East and Russia, 1914–23. Routledge, 2002. P. 117. ^ Annemarie Sammartino. The Impossible Border: Germany and the East, 1914–1922. Cornell University, 2010. P. 36-37. ^ Kataryna Wolczuk. The Moulding of Ukraine: The Constitutional Politics of State Formation. P37. ^ a b Zvi Lerman, David Sedik. Rural Transition in Azerbaijan. P12. ^ Hala Mundhir Fattah. The Politics of Regional Trade in Iraq, Arabia, and the Gulf, 1745–1900. P121. ^ a b "How Ethiopian prince scuppered Germany's WW1 plans". BBC News. 25 September 2016. Retrieved 22 October 2018. ^ Davis, Robert T., ed. (2010). U.S. Foreign Policy and National Security: Chronology and Index for the 20th Century. 1. Santa Barbara, California: Praeger Security International. p. 49. ISBN 978-0-313-38385-4. Aksakal, Mustafa. The Ottoman Road to War in 1914: The Ottoman Empire and the First World War (2010). Brandenburg, Erich. (1927) From Bismarck to the World War: A History of German Foreign Policy 1870–1914 (1927) online. Dedijer, Vladimir. The Road to Sarajevo(1966), comprehensive history of the assassination with detailed material on the Austrian Empire and Serbia. Hamilton, Richard F. and Holger H. Herwig, eds. Decisions for War, 1914-1917 (2004), scholarly essays on Serbia, Austria-Hungary, Germany, Russia, France, Britain, Japan, Ottoman Empire, Italy, the United States, Bulgaria, Romania, and Greece. Herweg, Holger H. The First World War: Germany and Austria-Hungary 1914–1918 (2009). Herweg, Holger H., and Neil Heyman. Biographical Dictionary of World War I (1982). Pribram, A. F. Austrian Foreign Policy, 1908–18 (1923) pp 68–128. Strachan, Hew. The First World War: Volume I: To Arms (2003). This page was last edited on 5 April 2019, at 10:57 (UTC).